Northern Ireland's Jonathan Rea has won the World Superbike title a record four times in a row. Jonathan Rea’s name will forever be inextricably linked with the World Superbike Championship following his latest title heroics. The Northern Ireland rider is continuing to raise the bar higher as his record-shattering feats show no sign of abating. World champion Jonathan Rea celebrates in front of the fans at Magny-Cours in France on Saturday. At 31, Rea is statistically the most successful rider ever in the series, with his fourth consecutive world crown equalling Carl Fogarty’s title quadruple. The difference, though, is that Rea has retained his status as the championship’s number one rider for four straight seasons. 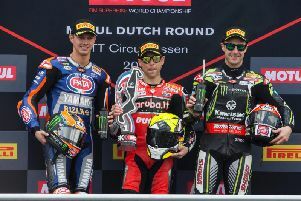 Such has been his stranglehold at the top since he made the move to Kawasaki in 2015, some critics have hit out at the monotony of World Superbikes, with Rea flying solo in a league of his own. That the Ballyclare man has virtually turned the championship into a one-man show should in no way diminish his accomplishments. Rea’s desire to be the best and his unflinching commitment to achieving that goal is to be admired. Since 2015, his remarkable consistency, incredible talent and unwavering motivation to continue winning has spurred him to four successive world titles and guaranteed his legacy as one of Northern Ireland’s greatest ever sportsmen. Yet Rea is far from done. No sooner had he successfully retained his world crown at Magny-Cours in France, the Kawasaki rider was already setting his sights on bettering the points record he established en-route to this third title in 2017. Rea could be forgiven for relaxing his grip on the throttle a little at the final two championship rounds, but it is his determination to keep challenging himself that has moulded him into the formidable champion he has unquestionably become. The former schoolboy motocross prospect dreamt of becoming a world champion one day, but Rea himself has exceeded his own expectations. A proud ambassador for Northern Ireland motorcycling, Rea’s achievements deserve the utmost respect. Next year, his only aim will be a fifth World Superbike title. Would anyone bet against it?